Classic Philippine literature thrives even to this day. Lam-ang is the hero of the only surviving complete Filipino Christian epic, Ti Biag ni Lam-ang (Translation: The Life of Lam-ang). It was collected and written in Ilocano by poet and missionary, Pedro Bucaneg, in the 17th Century. The story has been passed down from generation to generation, and along the way, it has been re-imagined, translated, rewritten, and adapted by numerous scholars, artists, and students. A Franciscan priest even adapted it into an awit, a metrical romance, like Ibong Adarna! Lam-ang?s story is an example of what scholars call an “epic of romance.” It illustrates his life and his courtship of the beautiful maiden, Ines Cannoyan, and allows readers (and listeners) to have a peak into traditional Filipino courtships, rituals, and conventions. Like all recorded Filipino epics, Ti Biag ni Lam-ang is brazen, over-the-top, full of magic, and utterly captivating. Lam-ang is what DC comic book superhero Captain Marvel would have been, if he’d been born in Ilocos in the 16th Century. Like Captain Marvel, Lam-ang has fantastical powers. Aside from great strength and skill in battle, Lam-ang can also call on the wind and rain to help him defeat his enemies, and start and douse great flames. Also like Captain Marvel, Lam-ang is actually much younger than he seems. Captain Marvel might look like a grown man, but his secret identity is Billy Batson, a teenager. Lam-ang doesn’t have any secret identity, but he started speaking the moment he was born. In fact, he even chose his own name and decided who was to be his godfather! The very first question he asked was about what had happened to his father. When he found out that his father had disappeared while fighting the “tattooed Igorots,” he immediately went off to search for him and avenge him, much to his poor mother’s dismay. He came back victorious, of course, and Lam-ang’s adventures had only just begun. Parents: Don Juan Panganiban (no relation to Don Juan de Berbania) and Namongan (sometimes also spelled “Namungan”). Like his son, Don Juan also had the ability to call down the wind and the storm, and he used this awesome power to build his wife Namongan’s birthing bed. Namongan is a constant presence throughout Lam-ang’s story; fretting over him when he leaves to seek out his father, advising him when he decides to woo Ines Cannoyan, and supporting him in all of his endeavours. The tattooed Igorots, who killed Lam-ang’s father and mounted his skull on a bamboo pole while they celebrated a headhunting festival. Lam-ang told them to call on their other tribe-members and to assemble so that he could fight them all at once. They bore down on him with spears, but none could touch him. He mowed them down with his sword until only one tribesman remained. Lam-ang mutilated him and then let him loose so that the tribesman could go and show any remaining Igorots what had become of the tribe that had tangled with Lam-ang. The largest crocodile in the Amburayan River. Lam-ang defeated it with his bare hands. He then gave the crocodile’s teeth to the village maidens who helped him wash his hair. Sumarang the giant, who also coveted Ines Cannoyan’s hand. Lam-ang vanquished Sumarang with his own spear; calling on the sea winds to bear Sumarang aloft across nine hills. A giant tioan-tioan shark that devoured Lam-ang whole. This creature killed Lam-ang, but expelled his bones. This allowed Ines Cannoyan and Lam-ang’s animal friends to resurrect him. An old woman of Nalbuan, who was known for her strong hands, and who was the one who finally managed to deliver Lam-ang. Guibuan, the old man Lam-ang chose to be his godfather moments after he was born. Old Marcos the diver, who tried and failed to help Namongan give birth to Lam-ang, but who later aided in Lam-ang’s resurrection by diving for Lam-ang’s bones and bringing them to his widow, Ines Cannoyan. He was generously rewarded for his efforts. A yellow-legged rooster who served as Lam-ang’s negotiator for Ines Cannoyan’s dowry. The rooster also destroyed Ines Cannoyan’s parents’ outhouse by flapping his wings, and taught Ines how to resurrect Lam-ang. 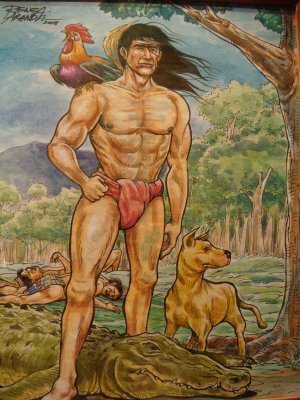 He defeated an entire tribe of Igorots, with the help of the south wind and his mighty campilan (a traditional Filipino sword, usually shaped like a long and wickedly large hooked machete). He charmed 99 maidens into helping him wash his hair with rice straw ash, and killed every fish in the river with the dirt from his hair. He killed the biggest crocodile of Amburayan River with his bare hands. He paid each of the 99 maidens a peso for every step they took to and from their house. He defeated the giant, Sumarang, with one blow. He wooed and won the heart of Ines Cannoyan of Calanutian despite her many suitors; some of whom were Spaniards and very rich men. He won the respect and approval of Ines Cannoyan’s parents with his riches and his generosity. He and Ines Cannoyan each held a lavish wedding feast, trying to outdo one another with their generosity. When the town leader of Calanutian told Lam-ang that it was his turn to dive for the rarang, he did so without hesitation, even though he knew that doing so would lead to his death. He gave Ines Cannoyan “signs” to let her know that he was dead: the stairs danced, and the kitchen collapsed. Lam-ang was resurrected, and he repaid Marcos, the old diver who found his bones, by giving him a pile of coins that was taller than him. You can also buy the first entry in the graphic novel trilogy on online bookstores. There’s also a film adaptation inspired by Lam-ang’s character currently in production. There’s no theatrical trailer yet, but it looks like it’ll be a great film to watch!